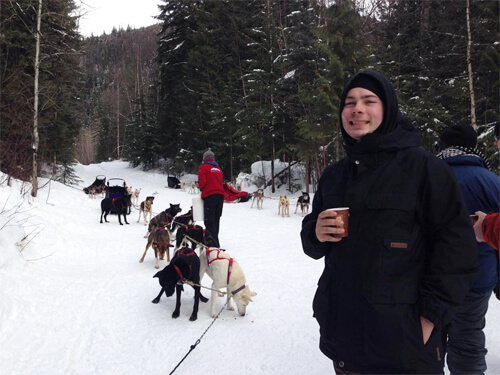 Dogsledding in the Canadian Rockies. 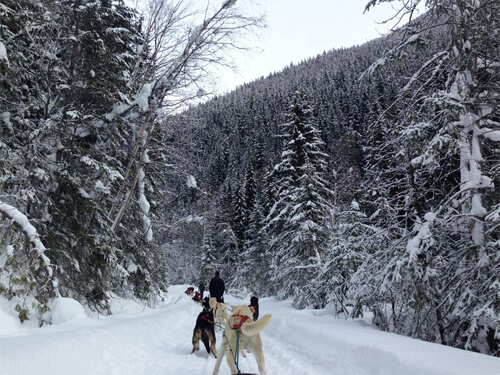 There are a few different areas you can go dogsledding in Alberta – the top three we found in our Google searches were Jasper, Banff and Canmore. The top hit for ‘Jasper dogsledding’ on Google is a company called Cold Fire Creek Dog Sledding. Although they advertise through Jasper, the Cold Fire Creek dogsledding tour is actually located 120 kms west of Jasper near Valemount, B.C. The prices for most of the dogsledding tours are pretty similar. Cold Fire Creek offers four different tour packages. 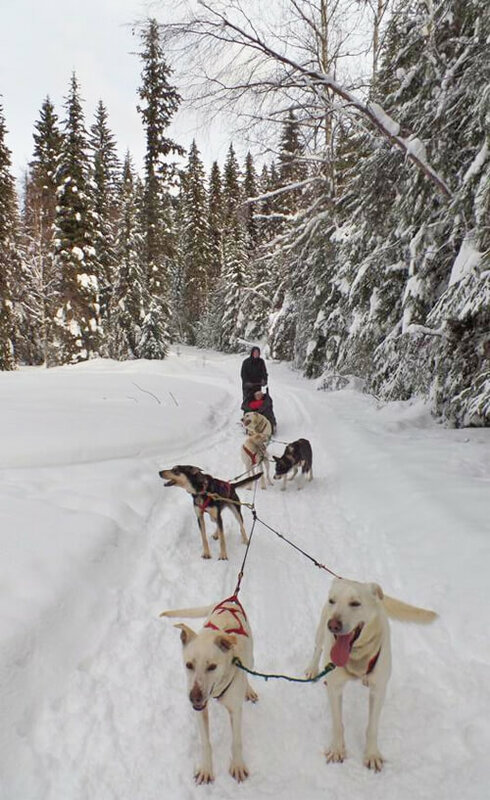 The most affordable package and the one Mike & I did was the 60 Minute Musher which departs at 1 p.m. – includes an intro to the dogs, equipment, instruction on how to drive a dog team, and one hour of mushing. We mush for 10 kms. Cost? $135/adult. There’s also three hour tours that include stopping for lunch, four hour tours where you ‘ascend 1,000 vertical feet by dog team along a 100-year-old trap line’ and a ‘moonlight run’ offered at night! The prices go from $135/adult up to $245/adult up to $300/adult with the most (the four-hour tour) costing $350/adult. It’s definitely an expensive date but it’s a pretty amazing experience! Before we take off on the dog sleds! 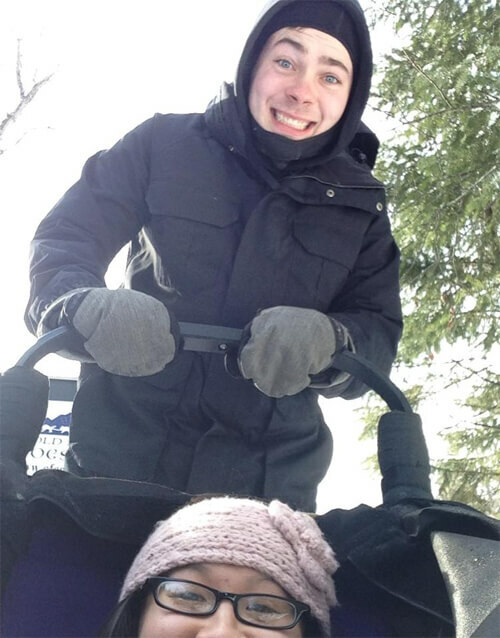 Mike and I tried to switch off so we both got to experience driving the sled but we quickly learned that I was not heavy enough to hold back 6 dogs! 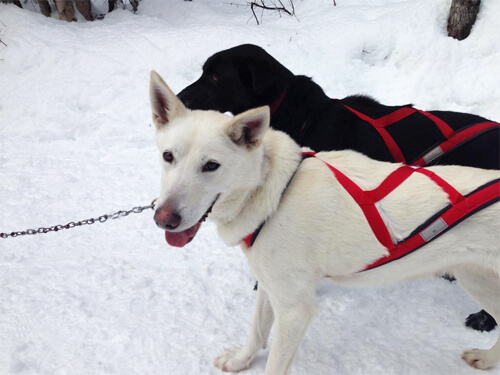 When we tried to switch, as soon as I lifted up the anchor from the snow, the dogs basically took off and knocked into the sled team ahead of us. 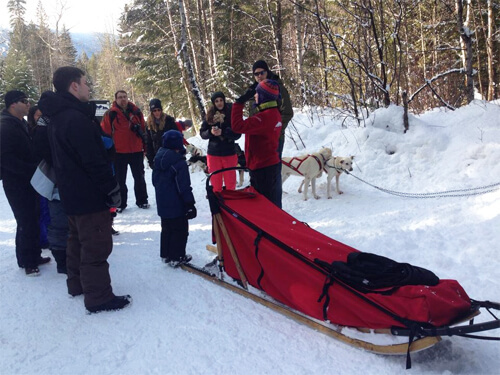 Whoops… then when Mike got out to help untangle the dogs, I was left as the only ‘weight’ on the sled so the dogs easily take off again! Mike had to do a running jump to step down on the brake and stop the dogs. (It’s not like I wasn’t trying to step on the brakes to stop the dogs, I really was. I kept jumping and jumping on the brake but nothing was happening!!) The guide came up after and said ‘I should have known you were too light to drive the sled.’ It was kind of a nice compliment in a way – that my physique is so small I can’t hold back 6 dogs or make any dent on snow with a brake, lol. Note that you absolutely can and have many opportunities to switch on and off with your partner for riding and driving, you just have to not be a weakling like me! Anyone can ride. Cold Fire Creek says they’ve had guests as old as 92 and as young as 5 months. They’ve also taken pregnant women and those with disabilities. There was a young child among our group that day as well! The dogs are adorable but very loud. They also tend to pee and poop along the tour, so you can get some funky whiffs as you go, but that passes quickly. Dress like you’re going skiing/snowboarding. And definitely bring your camera! They encourage that. There’s also lots of room in the actual sled, it’s quite roomy! Also remember if you’re doing this particular tour company, there’s a time difference from when you travel from B.C. to Jasper! We went on a perfect day. It wasn’t too cold at all and the sun was out! It was also so peaceful. For long stretches of time the only sound you hear are the dog’s paws hitting the snow as they ran. You’re surrounded by forest, mountains, and snow – everywhere you look. It was brisk so you felt alert, but it’s also an extremely relaxing experience (when you’re riding. Probably a little less relaxing for the driver). 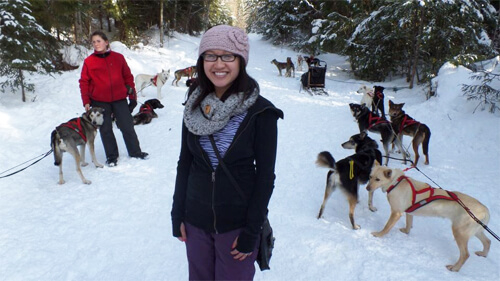 I had wondered just how OK I’d be with dogsledding because I can get very emotional very quickly when I think about even the remote possibility of animal abuse kind of situations (should we really be tying dogs up to drag us around for our enjoyment?) – but you could tell these dogs were having sooo much fun and you could tell the guides and the company owners care so much for these animals!! They all have names, they all have little nuances and big personalities. You can read about the care they give their dogs here. What an amazing experience! This trip cost us close to $500 including the actual sledding, hotel, lunch & dinners, gas, etc., so it was definitely a ‘big gift’ and something we wouldn’t be able to do often but wow, are we so happy we did it! Such a unique and unforgettable experience. I would absolutely recommend it to everyone! I really did feel like one with nature. :) People always talk about embracing winter because hey, we live here, so might as well make the best of it. This is definitely a way to make the best of it! So cool! !